Explore the numerous day-trip ideas around Denver: River Rafting & Tubing (in Idaho Springs) and United States Air Force Academy (in Colorado Springs). Next up on the itinerary: take in the awesome beauty at Mount Evans, look for gifts at Penzeys Spices, take in the architecture and atmosphere at Trinity United Methodist Church, and steep yourself in history at Union Station. To find reviews, traveler tips, and more tourist information, go to the Denver trip itinerary planner. The Route module shows you travel options from your home to Denver. In July in Denver, expect temperatures between 87°F during the day and 60°F at night. Cap off your sightseeing on the 9th (Tue) early enough to go by car to Rocky Mountain National Park. On the 10th (Wed), admire the verdant scenery at Many Parks Curve Overlook, then take a memorable drive along Trail Ridge Road, then take some stellar pictures from Farview Curve Overlook, and finally trek along Emerald Lake Trail. Get ready for a full day of sightseeing on the 11th (Thu): admire the sheer force of Alberta Falls and then explore the activities along Bear Lake. 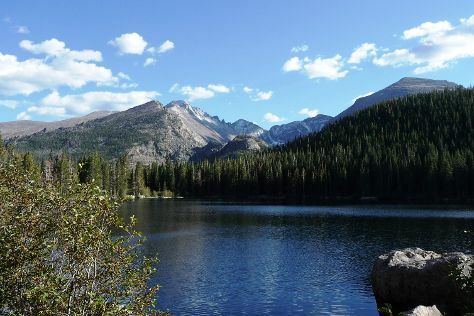 Quickly create a custom-made itinerary for Rocky Mountain National Park using our trip planner. Traveling by car from Denver to Rocky Mountain National Park takes 2 hours. In July, daily temperatures in Rocky Mountain National Park can reach 91°F, while at night they dip to 59°F. Wrap up your sightseeing on the 11th (Thu) to allow time to travel to Craig. The City of Craig is a Home Rule Municipality that is the county seat and the most populous municipality of Moffat County, Colorado, United States. Use Inspirock's suggestions to plan your Craig trip and find the best activities and attractions for your vacation. Getting from Rocky Mountain National Park to Craig by car takes about 4.5 hours. Expect little chillier evenings in Craig when traveling from Rocky Mountain National Park in July, with lows around 48°F. You'll set off for Jensen on the 11th (Thu). Jensen is a census-designated place in eastern Uintah County, Utah, United States. Dinosaur National Monument visitor center has been added to your itinerary. Start off your visit on the 12th (Fri): explore the wealth of natural beauty at Dinosaur National Monument visitor center, learn more about the world around you at Dinosaur Quarry Visitor Center, and then take a memorable drive along Yampa Bench Road. On the 13th (Sat), you'll have a packed day of sightseeing: hike along Harper's Corner and then hike along Jones Hole Trail. To see maps, more things to do, photos, and tourist information, read our Jensen journey builder . Traveling by car from Craig to Jensen takes 2 hours. Traveling from Craig in July, expect somewhat warmer with lows of 59°F in Jensen. Wrap up your sightseeing by early afternoon on the 14th (Sun) to allow time for travel back home.